These questions are from a live audience at a training Myra recently delivered in New York. 1. How do you handle the customer who immediately demands to speak to a supervisor or manager without giving the Representative a chance to handle the issue? What you don’t want to do in this situation is flat out refuse to let the customer speak to a manager because that will only escalate the situation. You also don’t want to dismissively transfer the caller to your manager. Even though the transfer would be honoring the customer’s request, you are actually teaching customers to escalate. “I’m sorry you feel you need to speak with someone else, but that’s the reason I’m here. I have been given full authority to help resolve your concerns. May I have the opportunity to resolve this first? 2. I’m not paid enough to put up with callers who yell or cuss. Do you feel it is appropriate to hang up on abusive customers? No one should have to endure verbal abuse from irate and unreasonable customers. We all have our own thresholds of tolerance of difficult behavior and only you determine your threshold. Once you’ve reached your threshold, I believe terminating a phone call is appropriate providing you have (a) sincerely attempted to create calm and diffuse anger and (b) you end the call as diplomatically as possible. 3. What would you say is the single biggest mistake companies make when speaking with angry or unreasonable customers and what can we do about this? A common mistake customer service professionals make is not acknowledging the fact that the customer is upset. I realize it might seem logical that you would not want to point out the fact that your customer is angry for fear that it might only exacerbate the issue, but actually, just the opposite is true. It just isn’t helpful to ignore anger or tip-toe around the customer’s anger and here’s why. There is something known as the communication chain. When people communicate, they expect the person or persons they are communicating with to respond or react. This reaction is a link in the “communication chain.” A failure to respond to communication leaves the communication chain unlinked (or broken). For example, If I walk into my office and say… “Hi Terasita, how are you?” ….and she says absolutely nothing, she’s broken the communication chain. And that leaves me feeling awkward, perhaps embarrassed. 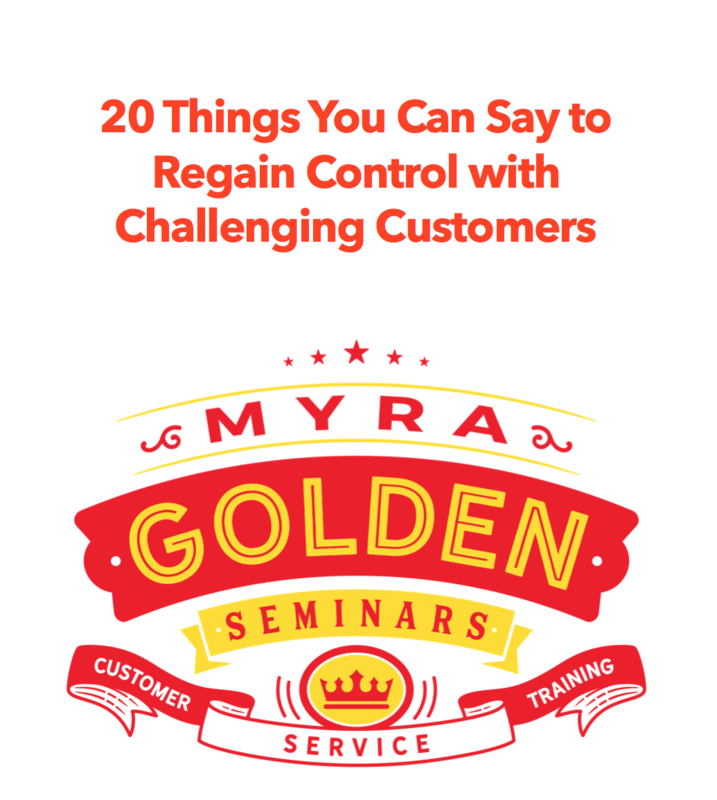 If a customer expresses anger and we fail to respond to it, the communication chain is broken and the customer feels like they are not getting through, that you are not listening. So, the customer may speak louder to make his or her point. They might become even angrier and more difficult; as they are resorting to whatever it takes to feel heard and understood. You can keep your angry customers from getting angrier by acknowledging their anger and responding to it. You can respond to anger with a statement like, “Clearly you’re upset and I want you to know that getting to the bottom of this is just as important to me as it is to you.” This statement directly and professionally addresses anger – without- making the customer even angrier. Now that the anger has been acknowledged, you have completed the communication chain. 4. Is there truly a benefit to letting (angry) customers vent and if so, how long is appropriate? There truly is a benefit in letting angry customers blow off steam through venting. An Angry customer can be compared to an erupting volcano. When a volcano is erupting, there is nothing you can do about it. You can’t speed up the eruption, you can’t put a lid on it, and you cannot direct or redirect it…it must erupt. When a customer is angry, they must experience and express their anger…through venting. We should not interrupt them or tell them to “calm down.” This would be as futile as trying to tame a volcano. A volcano erupts and eventually subsides. Your angry customer will vent and eventually calm down. A good vent doesn’t need to last very long at all. I suggest allowing your customer 30-45 seconds for venting. This is enough time for your customer feel heard, but not so much time that the customer flies off the handle. After about 45 seconds, the venting often becomes redundant or rambling and customers may be even making themselves more upset so you will need to regain control of the conversation after this window of time. 5. Dealing with difficult customers over the phone is one thing, but how do you diffuse anger when the irate customer is 2-feet away from you. a) Avoid the appearance of a physical challenge. Body language is powerful in any human interaction and especially so with angry or hostile customers. Your body language needs to send the message that you are cooperative and open. The best stance is going to be to the side of the customer. This way, you pose no physical challenge to the customer and you’re also in a less vulnerable position should the customer become violent. b) Help customers feel they have choices, options, and control (Bacal, 1998). It’s very important for customers to feel they have some control over the outcomes of their situation. Give them options and let them make choices, even small ones. Reducing choice and removing privileges tends to encourage aggression. 6. How do you explain to a customer that you cannot honor their request for a refund or exchange without having them get really upset with you? 7. How can I safely apologize to a customer for a problem that is not the fault of the company? I want to apologize as a way to rebuild the relationship with the customer and yet I don’t want to assume blame for the problem. Every email that goes out from your customer service team has your company’s brand in the signature line, it puts your corporate reputation on the line, and at the fingertips of a disgruntled customer, your emails can be plastered all over the Internet by way of a powerful blog. A customer posted a response letter from Southwest Airlines on the Consumerist website that provides an outstanding example of how to give customers a frank, yet the safe explanation of why a problem occurred. The transparent justification of the problem in this letter subliminally offers an apology, makes the letter feel personal, and it certainly rebuilt trust with the recipient. Start at the final paragraph of your email and read it backward. The average company takes 46 hours to respond to a customer’s email. This is not okay with customers. You need to shoot for responding to emails within 2-4 hours. Is this easy? No, but you need to align your processes and manpower to make it happen. Watch my full customer recovery video to get 5 steps for restoring customer confidence after service failures. More and more companies are discovering that Twitter can be a powerful tool for capturing the voice of the customer –and responding to that voice with immediacy. Twitter is a free social networking and micro-blogging service that enables its users to send and read other users’ updates known as tweets. One of the biggest appeals of Twitter is that it’s a great way to keep in touch with friends and colleagues quickly with short “tweets”. For example, this morning I tweeted: “Watching a bunny nibble grass and listening to birds sing as I work on my laptop from my patio this morning.” And just like that, I let 2000 of my friends know what I was doing. But, Twitter isn’t just a cool site for personal use. Businesses can use Twitter to have conversations with customers, solve problems, and to update on promotions and products. Here, I’m featuring 3 ways companies are using Twitter for customer service and I then I’ll show you how YOU can get started using Twitter TODAY for customer service in 4 easy steps. Zappos uses to Twitter to surprise & delight customers. Zappos followed through…the next day at 9:04am, my Zappos order I arrived. I was so thrilled that I went back to Twitter a posted a praise tweet. Cox Communications Tweets to find and fix problems. “Cox Communications in Tulsa just basically told me there’s nothing they can do about my modem constantly dropping Internet!!! !” 7:23 PM Apr 7th from web. And the Cox tweeter did help. He sent out a tech the next business day. After the problem was fixed, I posted a praise tweet. Southwest Airlines gets involved in conversations with customers. Last spring BusinessWeek magazine reported that a Southwest customer experienced a two-hour delay and while waiting around the customer tweeted his displeasure. The customer was surprised to receive a Tweet from Southwest the next morning with the following message: “Sorry to hear about your flight –- weather was terrible in the NE. Hope you give us a 2nd chance to prove that Southwest = Awesomeness.” How awesome is that? Ready to start using Twitter for customer service? Here are four simple steps to get you started, right now, on Twitter. 1. Setup a Twitter account TODAY. Go to http://www.twitter.com/ to setup your free Twitter account. @JetBlue – We’ve started our “Live from Terminal 5” concert series at JFK. Traveling through today? That’s Dan Dyer http://www.dandyer.com performing. 3. Conduct a search on your brand. Find out what people are saying about your brand by going to http://www.twittersearch.com/. Twitter search will give you real-time search results on every single conversation on Twitter about your brand. You’ll want to conduct this search every day, several times a day. 4. Get in on conversations about your brand. If your Twitter search pulls up anything about your brand, you’ll need to respond. Remember, when Cox did a Twitter search and found my gripe, they immediately engaged me with “If you need help getting your Internet problems resolved I’m here to help.” And engaging customers really is that simple. You spot a gripe (or compliment) and then you hit “reply” and start the conversation. You need to be right there when and where consumers talk about your brand online so you can respond in an immediate and personal way. Adopt these 4 steps for using Twitter for customer service and you’ll be on the cutting edge of serving customers through the powerful social media. Mary Kay is right, as studies indicate that employees find personal recognition more motivational than money. A work climate filled with praise and recognition is a workplace where employees are positive, productive and motivated. Recognizing and rewarding employees doesn’t have to cost a lot of money or take a lot of time. Perhaps the primary reason more call center supervisors and managers don’t take the time to intentionally motivate employees is that they lack the time and creativity to come up with ideas. After reading this post you will have no excuse for not motivating your team, because I am giving you 9 low cost ways to recognize and reward your employees. And as a special bonus, you’ll also get tips on how to prevent burnout in call center agents. I hope you find this “slide” blog post helpful.